Stelrad Radiators – one of the leading radiator manufacturers in the UK – has been awarded a prestigious award by Grahams Plumbers Merchants. 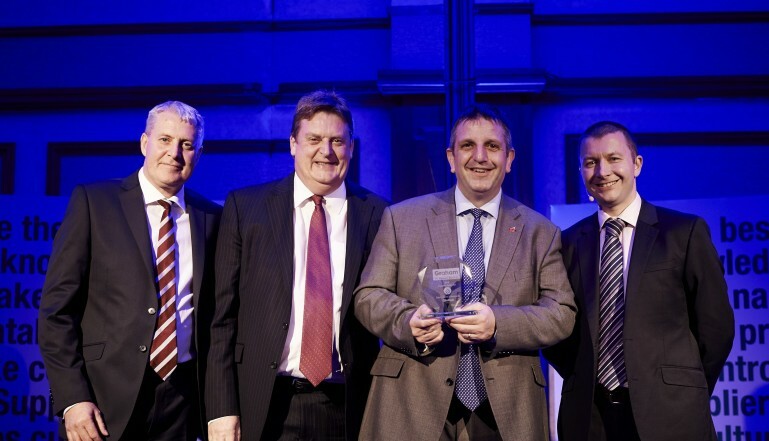 At the recent National Suppliers Conference, Stelrad was presented with the 2015 Supplier Award for Rapid Speed of Response. The award took into consideration feedback from the group’s branches around the country and reflected the on-going day-to-day response provided by Stelrad to Grahams – over the full year – not just a one off response situation. In particular the award reflected the contract support response times – the speed with which paperwork and enquiries are handled. Stelrad manufactures and distributes well in excess of 2 million radiators bound for heating systems around the UK, every year, with all its products sold via plumbers and builders merchant outlets. The company operates from its national manufacturing and distribution centre in Mexborough in South Yorkshire. Left to right: David Gledhill, managing director at Grahams Plumbers Merchant, Bernard Barrett, Stelrad Southern Sales Director, David Bainbridge, Stelrad Northern Sales Director and Jason Smith Category Director at Grahams Division at Saint Gobain.